Seagate is revving up its flash-storage portfolio with updates to its Nytro solid-state line, along with a demonstration of a blisteringly-fast 64TB SSD. The new products debut today at the Flash Memory Summit in Santa Clara, California. The updated solid-state drives—including the Nytro® 5000 M.2 non-volatile memory express (NVMe) SSD and the Nytro 3000 Serial Attached SCSI (SAS) SSD—address different segments of the cloud and data center markets and help customers maximize the value of their data. 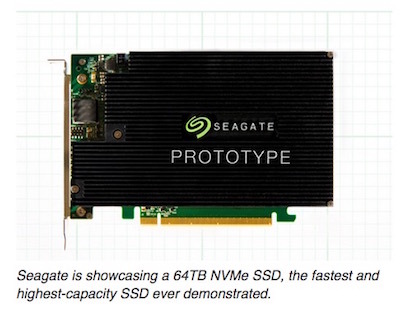 Seagate also will showcase a 64TB NVMe add-in card reading at 13 gigabytes per second—the fastest and highest-capacity SSD ever demonstrated. Here’s a closer look at what’s new. Seagate’s technology demonstration takes advantage of the industry standard M.2 form factor to combine eight SSD controllers into a single PCIe NVMe add-in card. As a result, servers benefit from multiple high-performance controllers managing the SSD’s flash capacity through the one PCIe socket. Customer samples of the technology are anticipated in the first half of 2018. 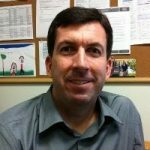 The demonstration shows the future of hyperscale and high-performance computing (HPC) storage solutions, says Kent Smith, senior director of product marketing, Seagate flash products. The new Nytro 5000 NVMe SSD is a cost-effective, lower-power technology with 2TB of industry-leading capacity. With performance levels as high as 67,000 input/output operations per second (IOPS) per watt, it doubles the performance of the previous-generation product, the Nytro XM1440 M.2 NVMe SSD. The Nytro 5000 is targeted at direct-attached storage, acting as a cache for HDDs, and helping to separate “hot” data from “cold” data. The Nytro 5000 also is available in Seagate Secure™ SED (self-encrypting drive) models with the TCG (Trusted Computing Group) protocol. The SSD’s new features match the growing needs of demanding enterprise applications like data mining and online transaction processing, where fast data access and processing power are key. It has five times the sequential read and twice the random read performance of SATA SSDs. 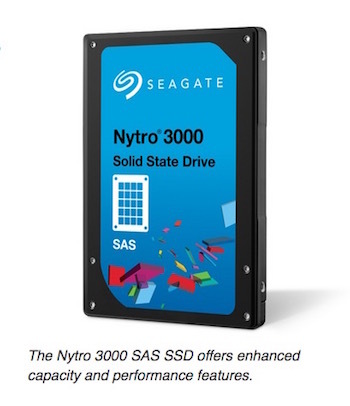 The new Nytro 3000 SAS SSD offers enhanced capacity—up to 15TB, or more than four times the capacity of the previous version, the Seagate 1200.2 SAS SSD—and performance features, and a dual-port SAS interface to maintain data integrity. It also offers more than 2,200 megabytes per second (MB/s) in sequential read performance through a 12 gigabits per second (Gb/s) SAS dual-port interface. All of which means less storage bottlenecks and higher data reliability, availability and scalability. The Nytro 3000 is aimed at data center environments where data availability and capacity are critical, such as content streaming services and software-defined storage (SDS) configurations. 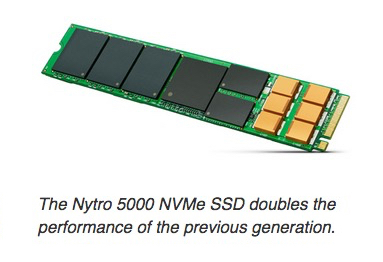 The Nytro 5000 NVMe M.2 SSD and Nytro 3000 SAS SSD will be available later this year using 3D NAND flash technology. The new SSDs also reflect a simplified branding, with the “Nytro” name now encompassing Seagate’s enterprise-class NVMe and SAS SSD lines.